A gift basket with enough ham for a party! Photo courtesy TommyMoloneys.com. Looking for a meaty gift for an important someone? 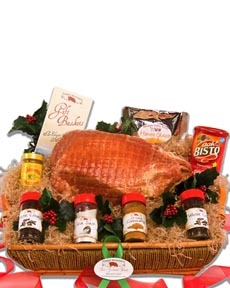 A Hickory Valley Farms ham gift basket from Tommy Moloney’s might be just what they’d like to dig a fork into. We received one as a gift. The generously sized boneless ham, between 12 and 15 pounds, was especially appreciated by THE NIBBLE staff because the salt content is noticeably less than with many other hams—we often find that other hams are significantly over-salted. Tommy Moloney’s processes the ham with a sherry and maple cure and applewood smoke. It even has a charming skin pattern, a “quilted” look that is made by the netting in which the ham is smoked. Fully trimmed, there’s no fat to score. It’s 100% meat for eating. The ham arrived in a nice, reusable basket (which we immediately repurposed to hold mail and magazines). It’s ready to heat and eat (or enjoy cold), and is packaged with all the necessary garnishes: a jar of Colman’s English Mustard; bottles of cloves, cinnamon and sea salt (not needed! ); a packet of honey ham glaze; and, for those who want gravy, a box of Bisto gravy granules. And now the good news: The ham gift basket is on sale through the end of the holiday season for $98.00, a 30% discount off the regular price of $140.00. Hungering for ham? Head to TommyMoloneys.com. Find more of our favorite hams, recipes, and the different types of hams in our Pork Section.